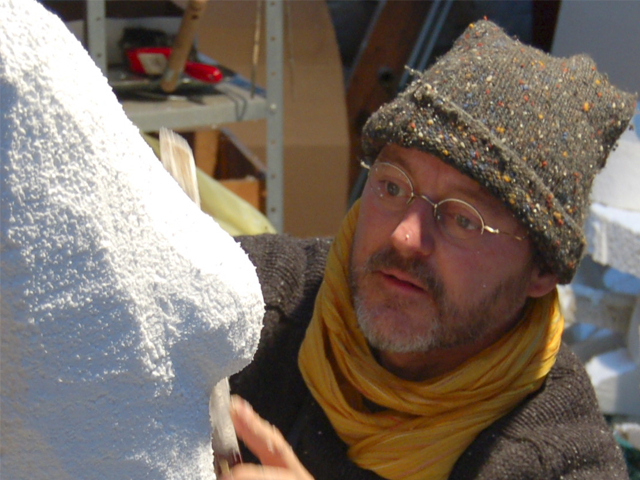 Actor, scenographer, puppeteer, author, director and «froecheleer,» born in Brussels, 18 July 1962. Education: 1st prize in the Dramatic Arts at the Royal Conservatory of Brussels in 1984, in the classes of Claude Etienne and Pierre Laroche. Concomitantly with his work as an actor, he spent several months assisting the scenographer Jean-Claude De Bemels in his studio. After performing as an actor for the Théâtre National de la Communauté Française de Belgique, the Théâtre du Rideau de Bruxelles, the Théâtre Vagabond (for young audiences) and the Théâtre du Miroir Magique, in 1987, during the creation of the show «Le tour du bloc,» he founded the Tof Théâtre. 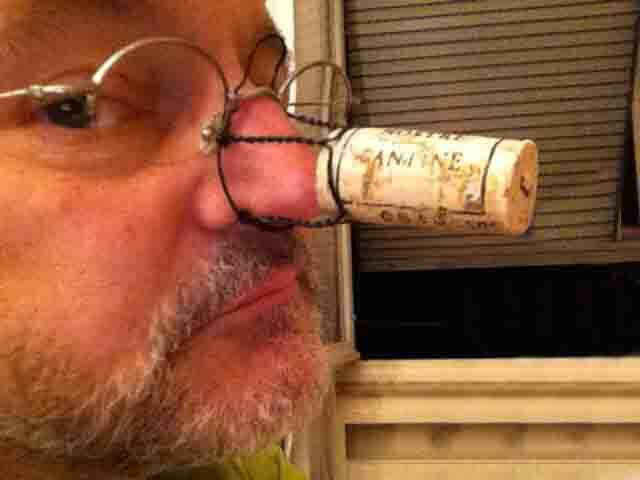 With the creation of his own theatre company, he now devotes himself almost exclusively to the Tof. 1981 -Actor in «L’hiver à l’envers,» a show for young audiences. Collective creation with Denise Yerlès and Joël Smets, directed by Didier de Neck at the Théâtre Vagagond in coproduction with the Théâtre Isocèle. 1982 -Actor in «La force de l’habitude,» by Thomas Bernhard, directed by Henri Ronse at the Nouveau Théâtre de Belgique. 1983 -Actor and scenographer for «L’atelier» by Jean-Claude Grumberg, directed by Jacques Viala. 1984 -Actor in «L’éventail» by Goldoni at the Théâtre National de Belgique. Directed by Orazio Costa Giovangigli. 1984 -Scenographer for «Kean,» directed by Raymond Avenière at the Nouveau Théâtre de Belgique. 1984 -Scenographer for «Beethoven, Georges, Paulette et les autres» by Roland Dubillard at the Théâtre National de Belgique. 1985 -Scenographer with Christine Mobers of the show «Le pain de ménage et Le plaisir de rompre» by Jules Renard, directed by Jacques Viala at the Théâtre Impressionniste. 1986 -Actor in «Alice au pays des merveilles,» adapted for the stage and directed by Frédéric Latin for the Théâtre du Miroir Magique. 1987 -«Le tour du bloc» (Tof Théâtre-La Filipendule) conception, co-production and performance. 1989 -« Radio Tom » (Tof Théâtre), show for young audiences. Conception and scenography. 1992 -«Jules Tempête,» Co-director with André Laliberté at the Théâtre de l’Oeil in Montreal. 1992 - «Camping Sauvage» (Tof Théâtre), a show for young audiences: conception, co-writing, scenography, staging and performance. 1995 -«Cabane» (Tof Théâtre), a show for young audiences: co-writing, scenography and staging. 1996 -«Le Roi de la Frite» (Tof Théâtre), a street show: conception, co-writer, scenographer, staging and performance. 1997 -«Eddy le saisi» (Tof Théâtre) a performance with a giant walking puppet: conception, creation of puppet and manipulation. 1998 -«Patraque» (Tof Théâtre), a show for young audiences: co-writing, scenography and staging. 1999 -Staging for «La femme du soldat inconnu» be Eric De Staercke and Bruno Georis at the Théâtre de la Toison d'Or, a show for adults. 2001 -«Le Petit Bazar Erotik» (Tof Théâtre), a show for adults: Co-conception, co-staging and direction with Caroline Bergeron for the evening; conception, script, scenography and staging of the shows «Monsieur et Madame Beaurestes,» «Monsieur Tiche à la plage,» «Léon fait son spectacle,» and conception and creation of the exhibition «Léon s'expose». 2002 -«Les Zakouskis Erotiks» (Tof Théâtre): Conception, scenography, staging and performance. 2002 -«Duel” (Tof Théâtre) by Caroline Bergeron: a show for young audiences: Assisted with the staging and manipulation of the puppets. 2003 -«A tout jamais !/Lebwohl, bis Morgen !» (Tof Théâtre in co-production with the Theater Marabu in Bonn), a show for young audiences: Conception, script (with the participation of the actors), scenography and staging. 2004 -«Bistouri» amusement park show (Tof Théâtre): Conception, scenography, staging and performance. 2005 -«Les Bénévoles» (Tof théâtre), animation/show for the street and theatre: Conception, scenography and staging. 2006 -«Bistouri» theatre version (Tof Théâtre): Conception, scenography and staging. 2008 -«Le Grand retour » (Tof Théâtre), a show for all ages: Conception, scenography and staging. 2009 -«Premiers pas sur la dune» (Tof Théâtre), a show for young audiences: Conception, scenography and staging. Prix de la Ministre de la Culture and Coup de cœur de la presse. 2009 -«Sur la dune» (Tof Théâtre), a show for adults: Conception, scenography and stage directing. 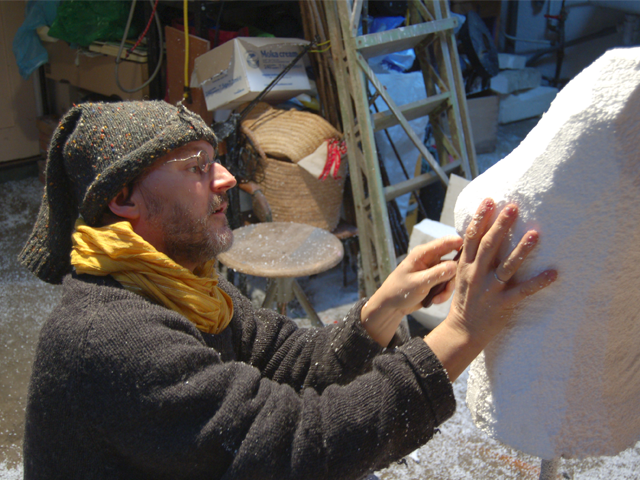 2010 -«Vy» by Michèle Nguyen: Artistic accompaniment, conception and creation of the puppet. 2012 -«A l’Ouest» (Tof Théâtre) short sketch of a show in progress (creation, January 2014), presented at the Théâtre National for the Festival XS, in Guyana, Burkina Faso and Quebec. 2013 -«Dans l’Atelier» (Tof Théâtre), a short show, followed by a workshop for building puppets for an audience of 8 years and up: Conception, scenography and direction. Creation in February 2013 at the Théâtre National - Brussels. 2014 -«Soleil Couchant» (Tof Théâtre), Conception, scenography, direction and performance. Co-production: ONZE, Biennale de la Marionnette et des Formes manipulées - Mayenne, Sarthe, Maine-et-Loire- France. 2014 -«L’Orchestre de Papier,» a musical performance by Max Vandervorst -Lutherie Sauvage- Director. 2014 -«Les Chevaliers» a show by OKIDOK – Outside observation, director for the manipulation of the puppet. During this period, spanning 28 years, he has also committed a few infidelities by collaborating with Tof’s competitors such as: Le Théâtre Vagabond (scenography for “Embrouillamaxi”), the Théâtre Loyal du Trac (scenography for “La Conquête de l'Ouest”), Roultabi Production (creation of sets, props and puppets for “Witloof Cabaret” and the adaptation of the sketch involving champagne bottles for the Paris "Festival du Cirque de Demain" at the Cirque d'hiver); and the theatre company, la Compagnie pour Rire (creation of puppets “Mélodie Foraine” and “L'histoire du soldat”); the theatre company la Casquette (creation of props for «Trois millions d'années tartines»); the Théâtre National de la Communauté française and the theatre company José Besprovany (creation of the puppet the Roi Sythe (King Sythe) for «La princesse de Babylone»), the Nuna Théâtre (little trivialities for «Plic»); participated in several ways in «Revues» by Charlie Degotte at the Théâtre Le Café and at the Théâtre National, as well as directing the manipulation of the puppets in «La Reine 27» for the Luxe theatre. 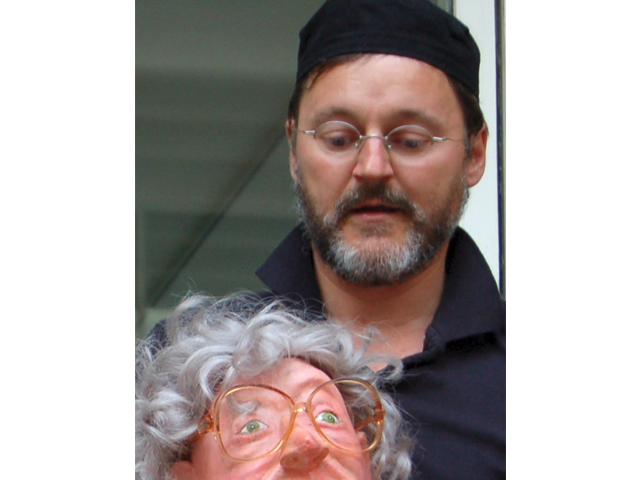 Since January 2010, professor/lecturer at the Conservatoire Royal de Mons, in the Dramatic Arts class of Frédéric Dussenne, within the project of staging and manipulating puppets as actor/author.